The province has fostered a culture of quality in health care — now is the time to make building a culture of workplace safety a part of that effort. Those working in health care and the patients they serve are entitled to an environment that is safe and free of violence. Unfortunately, too often those who work in health care are subjected to threats or actual violence. Statistics from the U.S. however indicate the problem is pervasive and growing. A 2001 U.S. Bureau of Justice Statistics (BJS) document reported an annual incidence of 16.2 assaults per 1,000 physicians, 21.9 assaults per 1,000 nurses, and 8.5 assaults per 1,000 healthcare workers with varying job titles. Statistics on workplace violence in Ontario's hospitals and other health care settings is more limited but In Ontario between 2002 and 2016 the number of accepted lost-time workers' compensation claims (i.e. those requiring time off work) due to assaults increased by almost 60 per cent. In contrast over the same time period all other types of lost-time claims decreased by 42 per cent. Unsafe workplaces will only contribute to these problems. While similar provincial statistics do not appear to exist for violence against physicians and others, social media and published reports abound that document threats and actual attacks on doctors and others while working. There is also growing evidence about the growing prevalence of physician burnout, depression, substance use and suicide. Unsafe workplaces will only contribute to these problems. Just as no health care worker goes to work intending to cause harm to a patient, no employer intends for their workplace to be a source of harm to those who work there. All of us who have a role in health care help establish work places that are safe and that violence prevention becomes part of a quality improvement culture. In the past few years we've seen more attention put on workplace violence in health care. In May, 2017, the provincial Ministry of Health and Long-term Care and Ministry of Labour published a progress report on an initiative started in 2015 to prevent workplace violence in health care. The report discussed the progress made by a leadership table which engaged over 100 workers, employers, government representatives, associations, unions, patient advocates and researchers to improve workplace safety culture and make health care settings safer for both staff and patients. A series of 23 recommendations emerged from this process as well as a series of tools and resources that hospitals can use to implement effective workplace violence prevention programs. One of the recommendations was that workplace violence prevention plans be included in the Quality Improvement Plans (QIPs) submitted annually to Health Quality Ontario by hospitals. As a result of this recommendation, Health Quality Ontario has asked hospitals to collect and improve upon the number of incidents of workplace violence. If an organization is building a reporting culture for workplace violence, the QIP target may be to increase the number of reported incidents. If the organization's reporting culture is already well developed, the QIP target may be to decrease the number of incidents of workplace violence. A new Health Quality Ontario report on workplace violence prevention looked at data in the 2017/18 QIPs. It shows organizations including hospitals are partnering with clinical and non-clinical groups as well as with other organizations to address the issue. Six hospitals are working to implement standard workplace violence prevention strategies across the organizations. The Joint Centres for Transformative Healthcare Innovation, led by Michael Garron Hospital and Southlake Regional Health Centre, have strengthened practical knowledge and expertise on workplace violence prevention strategies. Considerable time has been spent over the past year in putting together a Workplace Violence Playbook which is currently being implemented within the six hospitals. Grey Bruce Health Services' Mental Health program offers critical incident debriefing to staff who have experienced a traumatic experience on the job. The Champlain Local Health Integrated Network (LHIN) has in place a documented process for employees to report incidents of workplace violence, and for the prompt investigation and correction of circumstances that pose a risk of workplace violence. 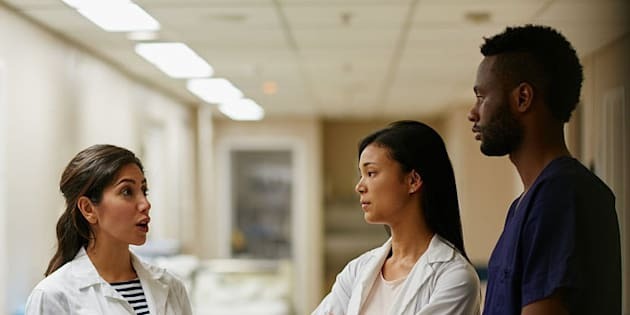 Our intent is that by looking at the issue of workplace violence in the Quality Improvement Plans, activities are viewed through an improvement lens rather than a compliance lens, so hospitals and other organizations across the system make changes to improve the quality of care rather than just to comply with regulations. One of the most significant ways in which workplace violence can be addressed through quality improvement is by building a culture of psychological safety in which all workers are empowered and to report their experiences. All those present in health care settings — administrators, front-line workers and patients need to be engaged in making those settings safe. There is a real opportunity to bring a focus to this important issue and give health professional and employee safety the attention it deserves. We have done a lot of work as a province to foster a culture of quality in health care — now is the time to make building a culture of workplace safety a part of that effort.